Company: MacMice Workspace Products Co.
A mouse is a mouse is a mouse, no? Well, no, not really. Everyone reading this probably has a mouse nearby, even if you are using a Trackpad on a PowerBook. But there are times, especially graphic manipulation, where using a mouse is simply easier and more accurate. And as we all know, Apple makes a decent mouse that ships with the Macintosh. Rugged, stylish, and easy to use. But it does have one problem; it has only one button! Mac OS X is all set up for a dual button mouse, as well as a scroll wheel mouse. 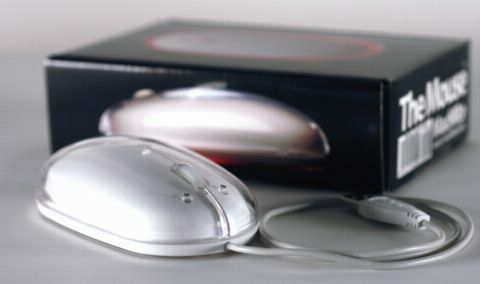 Some people have never tried a multi-button mouse, as hard as that is to believe, because they simply like the feel of the oblong Apple supplied mouse. Honestly, these people don’t know what they are missing, as a two-button mouse is simply a must-have, as is a scroll wheel. But do you have to sacrifice your Apple mouse feel to move up to one of these dual-scroll-Mouse? Not any longer. Named simply The Mouse, this new mouse has all the features you want in a better mouse; two-buttons, a scroll wheel, optical, and a cool, read glow emanating from under the unit. And at first glance and feel, you would almost think this is indeed an Apple built mouse. It looks very much like the standard Apple mouse, is just about the exact same dimensions as a standard Apple mouse, and even feels like an Apple mouse in your hand. And in some respects, therein lies the problem. MacMice did such a good job of making The Mouse feel like a stock Apple mouse, that it is too easy to remember this is a two-button mouse. Thus I have been accidentally right-clicking everything, all the time, without meaning to. Will you have this problem? It could be that my hand simply has a mind of its own, and when it feels an Apple standard mouse, it knows how it is suppose to click. And this after using The Mouse in preparation for this review for a month. I simply cannot get over that this is not an Apple mouse, but a third-party one. Again, it could simply be my hand is too confused. What can you really say about a mouse? It works fine. No skipping. No tracking problems at all. The left and right button work fine, as does the scroll wheel. But wait, what’s this? This is a THREE-button mouse! The scroll wheel itself is a button as well? How cool is that? After a month, my opinion is very high on The Mouse, except one small, but important, detail. The Mouse clicks loud. Too loud, I think. It is louder than a standard Apple mouse when clicking, at a higher pitch. My wife does not like it, as the sound of The Mouse clicking carries further than an Apple standard mouse, and WAY louder than my Logitech MouseMan Optical Dual Sensor. When comparing The Mouse, at $39.99, to the OEM Apple mouse, it is a clear winner, as long a loud clicking is not a problem for you. When I compare it to the Logitech MouseMan, however, it falls far short. Tracking on the Logitech MouseMan is much more accurate, it is more ergonomically in every way, it is at least 200% quieter, and it has a thumb button. But putting aside how far superior the MouseMan is, at twice the cost I should say, The Mouse is still a good, well-built mouse. Definitely an upgrade from an OEM Apple mouse, and it comes in both white and black. (Update, the Black model has sold out.) If you want a three-button mouse, and want the feel of the OEM Apple mouse, this is far and away the mouse for you. If you simply want to upgrade to a better mouse, and cost is not an issue, there are a ton better mice on the market.